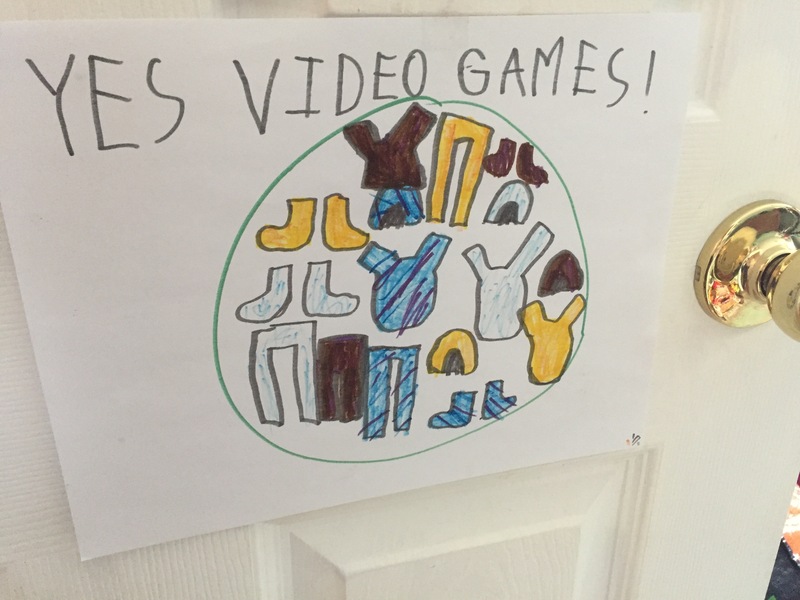 Recently, my kids got all excited about creating signage. E was the instigator in this, so these – the six most important things to keep in mind at the border – are his handiwork. They can be found on the shared bedroom door. This one’s pretty obvious. 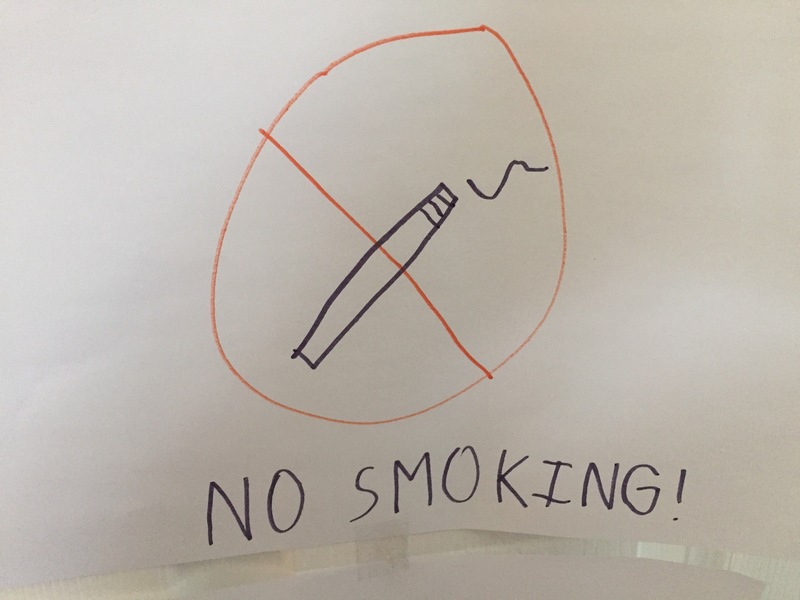 There’s no smoking in our house, which is easy because none of us is a smoker. Also pretty obvious – we are Canadians, after all. No firearms likely to be lurking in our sock drawers. Truth be told, we do our best to quash any games that involve guns as well, even completely imaginary ones. Even the sound effects. Too unfunny to be playful on any level, as far as I’m concerned. The items shown are Minecraft armour. Sometimes E gets to play with the iPad in his bedroom, but it’s far from being a given – especially during the school week. I think this sign is mostly wishful thinking/hopes for the power of suggestion. 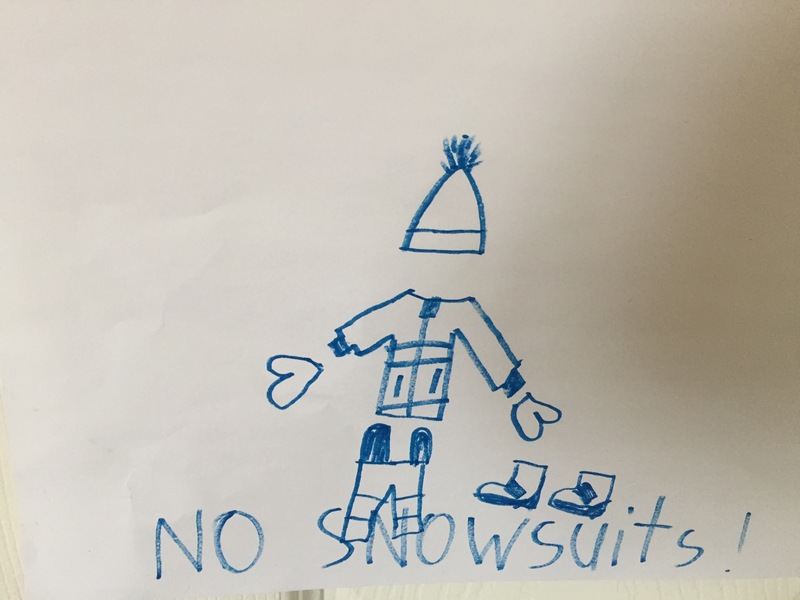 We have learned that it’s very important to take off our soaking wet snow gear AT THE DOOR. Sometimes we even remember the crucial step of hanging it up. So that’s no bears of the grizzly, polar, or black(/brown) varieties. Beanie, fuzzy, plush and/or cuddly can obtain passports to be admitted. So watch yourselves, folks. There are no border checkpoints, but I’m sure Big Brother is watching. Very cogent signage! Very sophisticated drawing of the cup with the bent straw – but what is the triangular food item? 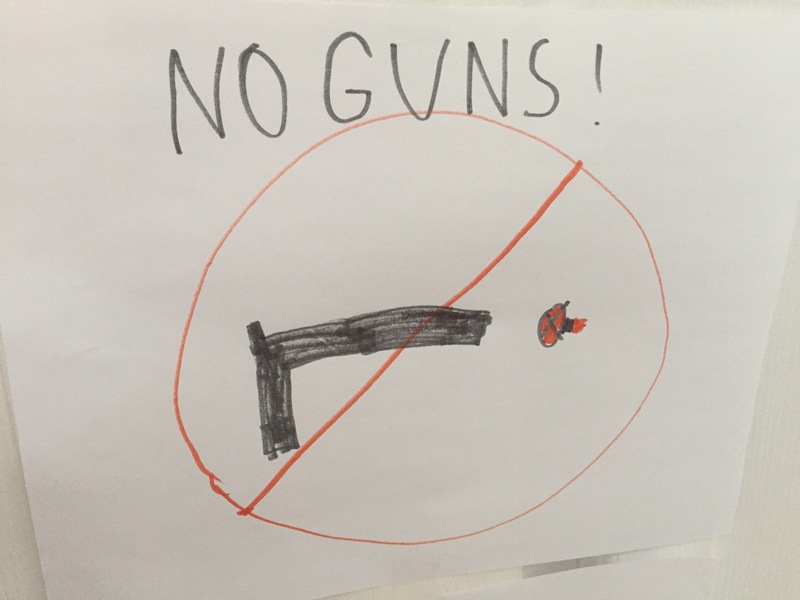 But easily the best is the “no guns”, which displays a reassuring lack of familiarity with actual guns (good on you, parents!) – and the enigmatic projectile emerging from the gun barrel is charming! What is it meant to represent? Haha! The projectile also reflects the lack of familiarity with guns, as it’s a flaming bullet. Love it! I probably would even enjoy the interview with the border guard at that crossing! I think the triangular food item might be a tortilla chip. As for the enigmatic projectile, I, too, am baffled, though it looks very complex and official. Our childhood (says the older sister of the previous commentator) didn’t have nearly as many border crossings as these kids’ childhoods. If it had, we might have had more signs along these lines. I’m not sure if THEY think of it as a border crossing… but it does seem to be instinctive for kids to have room signs staking something about their territory. Cogent, absolutely. 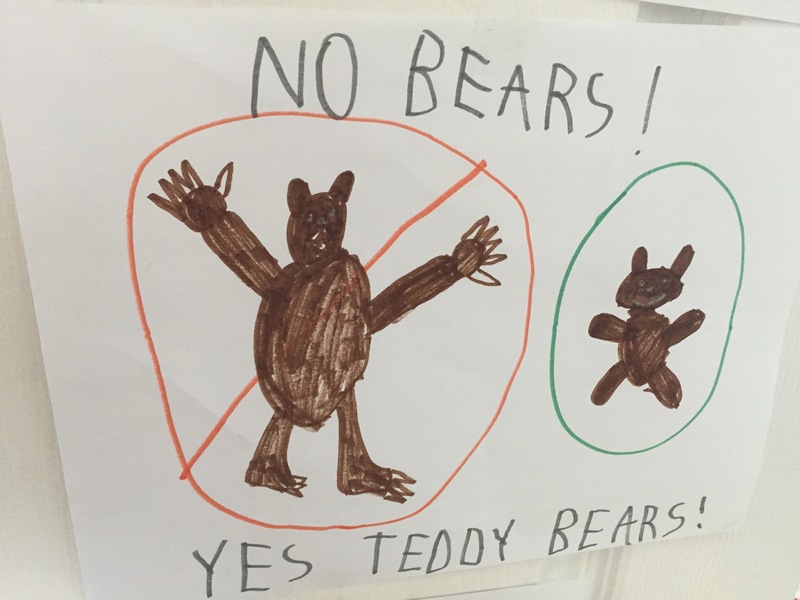 I like the clarity and complexity of the Bears sign. And I think the triangle is a sandwich. I imagine we must have made some signs, but seem not toI recall any. 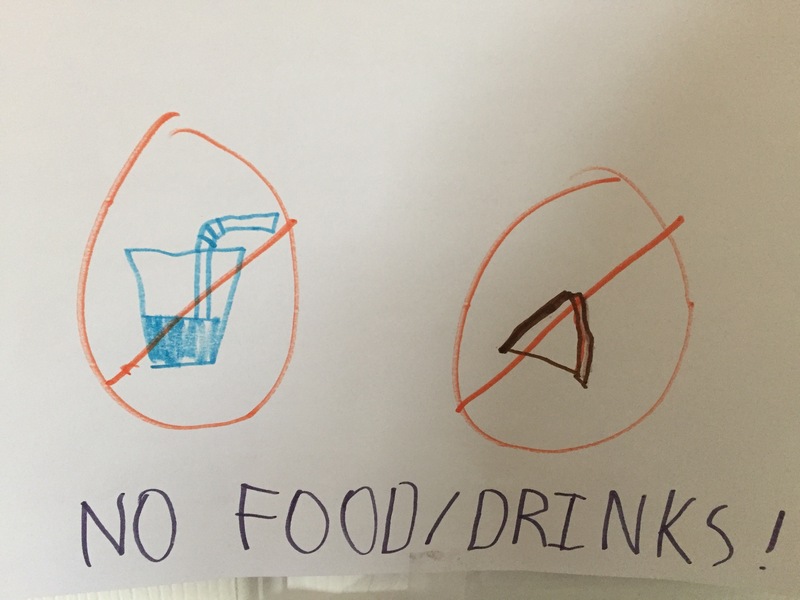 Signs to give instructions were not so ubiquitous in our childhood – the red circle with a line through some object had not been invented yet, and we were not much encouraged to post things on our doors. What i *do* recall (and still preserve a few examples) are the imperious, neatly written notes listing very clear parameters on what was allowed and not allowed in our shared bedroom. I must have been a great trial, four years younger than the *perfect* first-born – me with my incurable instinct for clutter.